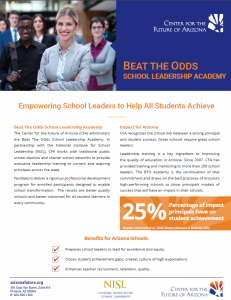 25% of a student’s educational success relies on the quality of the educational leadership of the school administrator. This means that the school principal is the second most important school influence to student success, after high quality teaching. For the past year, LAUNCH Flagstaff has built foundational relationships between The Flagstaff Unified School District (FUSD), local charter schools, early childhood educators, Northern Arizona University (NAU), and the Center for the Future of Arizona (CFA) to create the first cohort of administrators and aspiring administrators in the Beat the Odds (BTO) educational leadership academy in the Flagstaff area. In addition to improving the school climate for student success, the intention of LAUNCH Flagstaff in this effort is to build collaborative, collegial relationships among educational leaders across the community. We believe that strengthening these relationships will help to break-down existing silos between individuals, schools and organizations. Established a Memorandum of Understanding (MOU) between NAU and CFA for granting 6 graduate credits toward a Master’s Degree in Education and Administrator Certification or toward a Doctorate in Education and Superintendent Certification after completing BTO. The Flagstaff cohort will be the first to model this new arrangement and subsequent cohorts across Arizona will also benefit from this MOU. Received scholarship funding from GEAR-UP for a 50% reduction in tuition costs to schools and districts for participating in the first Flagstaff area cohort of BTO. Obtained initial commitments from FUSD, charter schools, preschools and NAU for participation in the first cohort, scheduled to begin in May 2019.